For those of you in Bristol over the weekend this is not to be missed!! 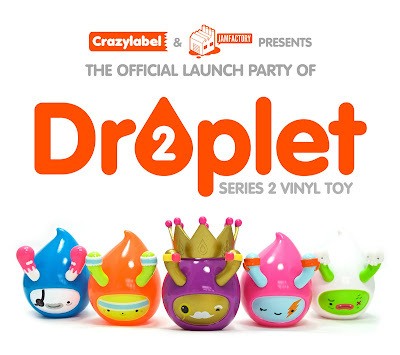 It's the launch of the second series of the Droplet vinyl toys designed by Gavin Strange ( Jam Factory). The launch event will take place at Fifty Fifty this Saturday, 6th February from 6pm and it'll be the first place in the world to get your hands on Series 2 of the toy. Alongside the launch of the Droplet, Gavin has organized a showcase of customized blank Droplets from a fantastic & diverse range of streetartists, designers and illustrators. Below is the very impressive line-up of talented artists who have all customized a blank droplet for the opening.